Laura enjoys morning coffee in Göteborg before departure. Today was a traveling day, during which we departed from Göteborg, stopped in Lund and Malmö, and finally arrived in Copenhagen. We awoke to Corey frying an elaborate egg scramble to make use of our variety of leftovers, including grilled corn, quinoa, sour cream, peppers, onions, and tomatoes. We even used our extra tortillas so that we could wrap the scramble into burritos. 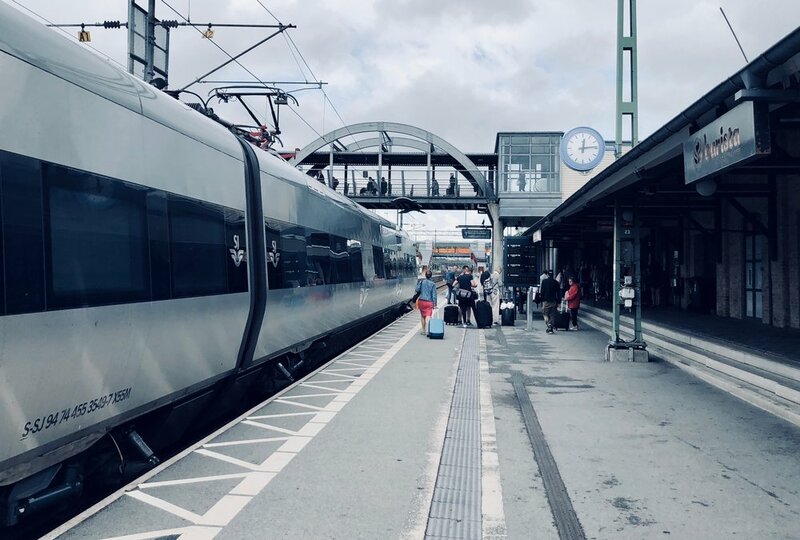 After eating our delicious breakfast and cleaning up the apartment, we made our way to Göteborg Centraal, where we boarded the train to Lund to meet our host for the day, Robert Bennesh. Lund is the home of Sweden’s second oldest university, Lunds universitet (Lund University). 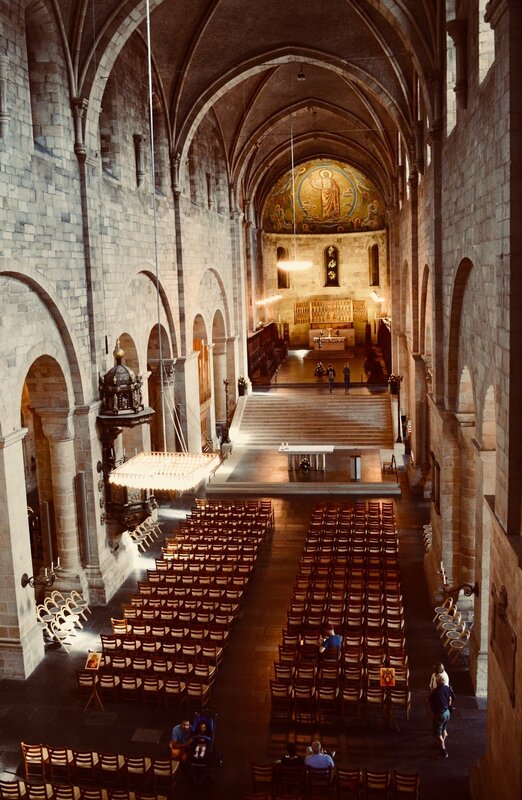 Lunds domkyrka (Lund Cathedral), which celebrates its 900th anniversary in 2023, and the university have had very intertwined histories, including shared leadership. Continuing in this tradition, in Robert’s role as the Director of Music at the Cathedral, he is also University Organist. In addition, the Cathedral is the seat of the regional diocese in the Church of Sweden, so Robert also has many duties related to organizing diocesan music. 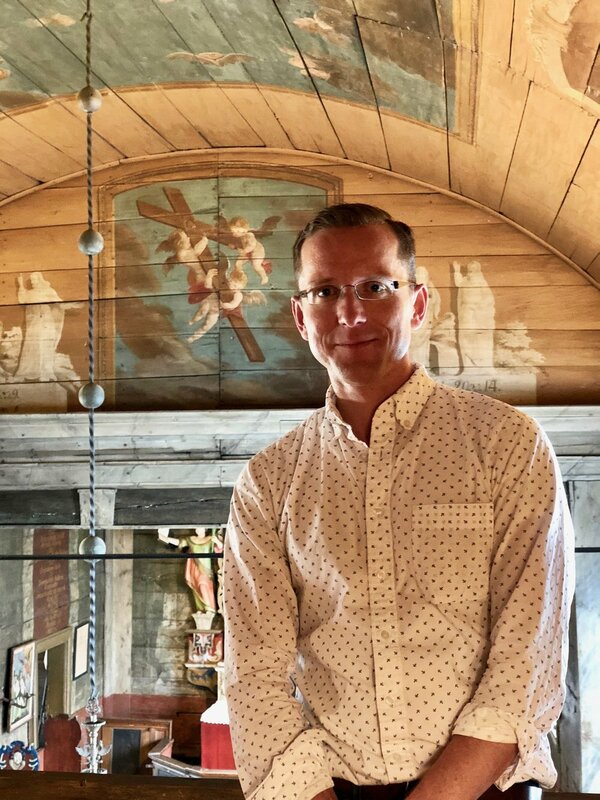 After dropping our luggage in the church offices, Robert brought us to Kulturen, an open-air museum spanning two city blocks that has amassed a collection of preserved buildings that were originally constructed in different regions in Sweden. Kulturen’s collection includes a small chapel from the Småland region that was built in 1652. The chapel was brought to Kulturen in the 19thcentury when the church was going to be dismantled, simultaneous with a wave of migration from Småland to America. Given this migration, our guide suggested that the chapel might actually be one that our ancestors might have worshipped in. As my mother’s family is Swedish, this very well might have been the case. The historic organ at Kulturen, housed in a 1652 Swedish chapel, Lund, Sweden. We visited the chapel to see a small one manual organ from the 18th century. Restored in the 1970s, the organ’s six stops had a clean and crisp tone and struck us as a smaller version of the Schiörlin organ in Jonsered we had seen the previous day. As we played selections from our Sweelinck and Buxtehude repertoire, we remarked that the Gedeckt, in particular, has a beautiful 8’ tone from top to bottom that sounds both sweet and supple in the room. In comparison, our least used stop was the Trumpet Regal, which Jennifer described as sounding like hungry sheep grazing in a pasture. Lund Cathedral organist Robert Bennesh introduces members of Boston Organ Studio to the 1934 Marcussen organ. After a brief lunch of open-face sandwiches in a small café at Kulturen, we walked to the Cathedral to see its large symphonic organ, the largest church organ in Sweden. The organ in its current condition was built by Marcussen in 1934. Building in the era of the Organ Reform Movement, Marcussen wanted to revive Baroque ideals. Simultaneously, however, the organ sought to maintain its status as the largest organ in Sweden. 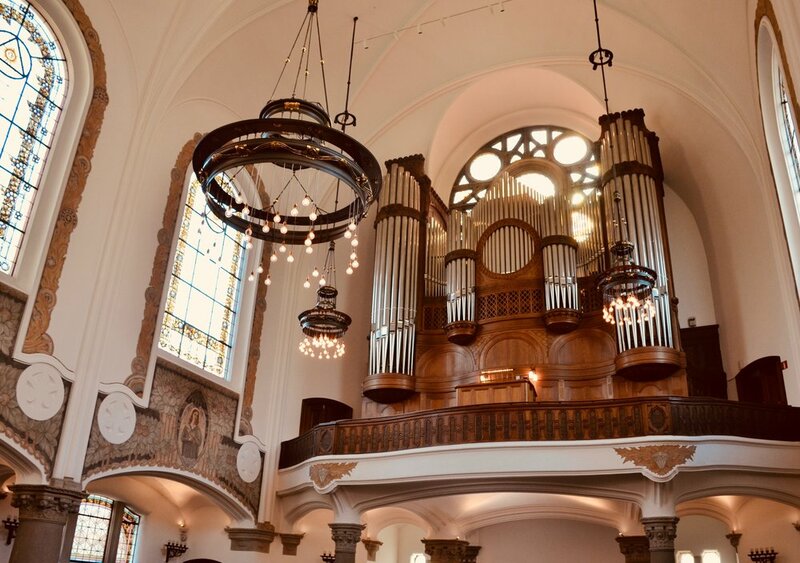 Putting quantity over quality, the 1934 instrument included new pipework of forty ranks and modified pipework from previous organs in the Cathedral, including the romantic pipework of 1836 Strand and 1876 Marcussen instruments. As Robert put it, they included anything and everything they could think of including, resulting in a very large instrument that is not aligned to any particular style. The cathedral is currently fundraising for the organ’s renovation with the hope of restoring the 1836 and 1876 pipework to its original condition and replacing much of the pipework added in 1934. The famous astronomical clock in Lund Cathedral, from 1424. To align with the organ’s size, we played a selection of our largest and grandest pieces, including Reubke’s Sonata on the 94thPsalm. As we played, we attracted the observation of visitors downstairs who were touring the cathedral. 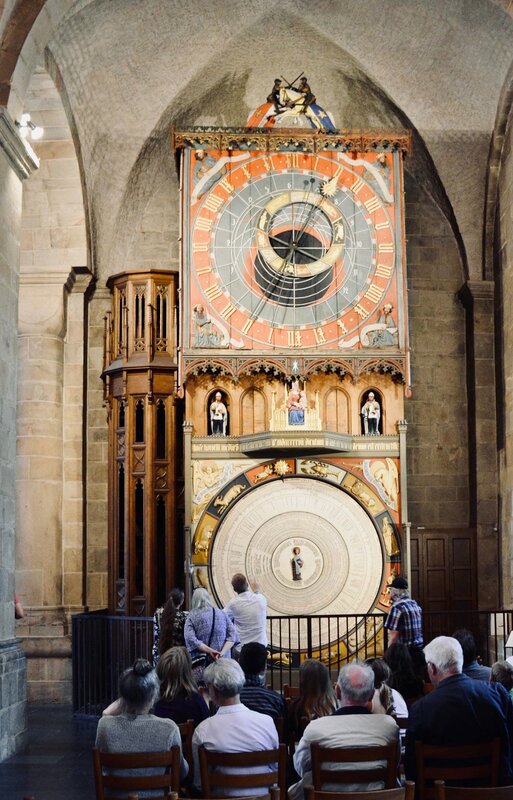 Unfortunately, we needed to stop playing the organ earlier than we would have liked—an astronomical clock downstairs chimes downstairs at 3 pm each day, for which a small crowd of tourists had assembled to watch. Upon the hour, the clock’s small figurines enacted fighting on horseback and a small procession while two trumpeter figures played the traditional Christmas hymn, In dulci jubilo. Robert explained that his duties include tuning the small organ within the astronomical clock that plays the In dulci jubilomelody twice a day. Before leaving the church, Robert gave us a brief tour of the rest of the Cathedral. The Cathedral’s daily services take place in different parts of the church, including its small chapels and the crypt. While in the crypt, Robert told us a myth about the building’s construction. Finn, turned into stone, holding onto one of the stone columns in the crypt of Lund Cathedral. In need of large men to complete the building, the architect went out to the countryside. There, he found a giant that agreed to help, but as payment, the giant requested to have the architect’s eyeballs as a toy for his son. Dreading that thought, the architect struck a deal: if he found out the giant’s name, the work would be free, but otherwise, the architect’s eyeballs would be his payment. Lo and behold, the architect heard the giant’s wife refer to her husband as Finn as the construction was being completed. The architect returned to the Cathedral and shouted, “Finn, Finn, put the last stone in!” Finn was so angry that he ran downstairs to destroy the building’s foundational columns. But, as sunlight shone in through a small window onto him, he was turned to stone. You can still see his stone figure holding onto one of the stone columns in the crypt today. Finn’s wife is also a stone statue in the crypt, but she does not have an accompanying myth. This fact has been the subject of doctoral dissertations in Lund’s gender studies department. Robert Bennesh gives us a tour of Lund Cathedral. As we prepared to leave, Robert explained to us that the Cathedral has also been significant in church history as it was the site of the Pope signing a declaration of unity with the Lutheran World Federation in 2016 (the Church of Sweden is a Lutheran denomination). Since that event, the church has actively been supporting ecumenical efforts. 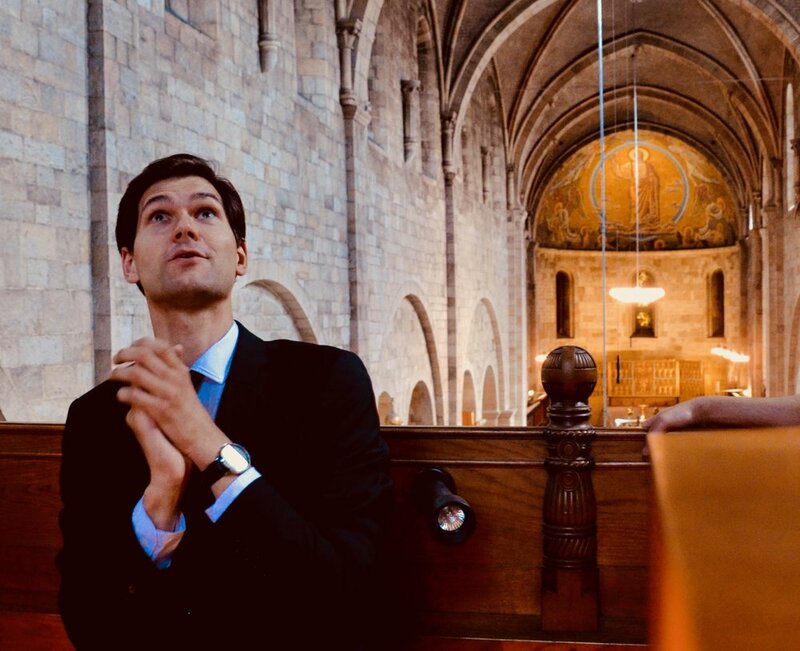 There is a weekly ecumenical service actively attended by both the Church of Sweden and Catholic congregations, and next year, the Catholic congregation will have all of their services in the Cathedral as their own church undergoes renovation. After a quick train ride, we found ourselves in Malmö. Lund, Malmö, and Copenhagen are all considered part of the same metropolitan area. Very well connected by public transportation, many travel between these cities on a daily basis for work. Robert, for instances, lives in Malmö and works in Lund. We had stopped in Malmö to visit S:t Johannes kyrka, the home of a largely romantic organ by Åckerman & Lund. Both the church and organ are rather young, having been inaugurated in 1907. The church’s architecture is in the Jugend style of that era, with somewhat modern features, including chandeliers with hanging light bulbs of varying lengths. The Åckerman & Lund organ in S:t Johannes kyrka, Malmö, Sweden. The organ itself was absolutely lovely, particularly its warm and pleasant tones that were well-suited to the room. Many of us commented as well that it was remarkably easy to play, unlike other instruments we’ve played with very weighty key action. Seizing the opportunity to play our French romantic repertoire, we heard the Final from Vierne’s Sixth Symphony, Franck’s Prelude, Fugue, and Variation, and the first movement of Widor’s Fifth Symphony, Allegro Vivace. Our host at S:t Johannes kyrka, Mats Hultkvist, then played a recital of Brahms, Lindberg, Stenhammar, and Dupré, which allowed us to listen to the organ down in the main sanctuary. Chris Porter, Brandon Santini, and Laura Gullett enjoying dinner at Warpigs in Copenhagen. We then bid farewell to both Mats and Robert and boarded yet another train to Copenhagen. Once we arrived in Copenhagen and dropped off our luggage in our AirBnb, we walked to a barbecue restaurant and microbrewery called Warpigs. The food and beer were fantastic and it was a lovely evening to sit outdoors and enjoy the ambience. Copenhagen and its surrounding region is our last destination of this trip. We are looking forward to savoring our final days together in Denmark, but simultaneously are already nostalgic for the musical experiences we have experienced. 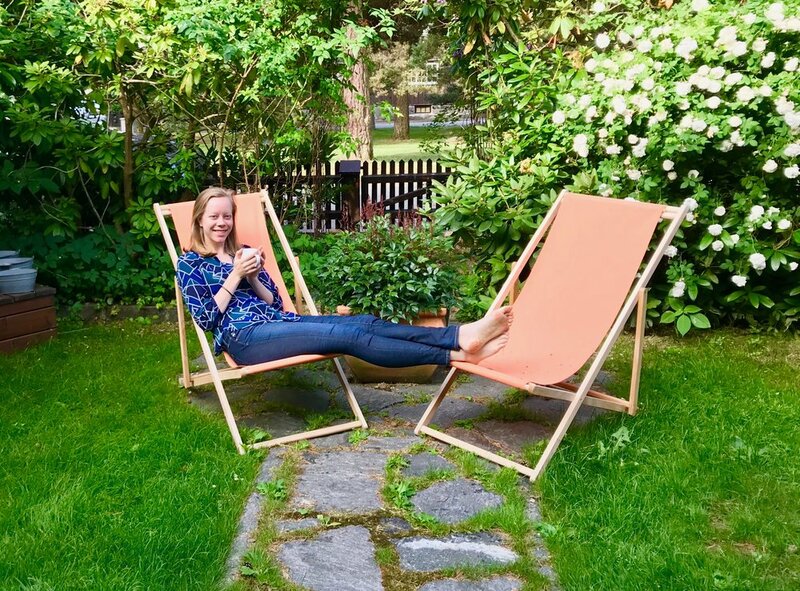 Laura enjoys morning coffee in the garden, before our departure to Lund. The high-speed train to Lund, Sweden. Arrival in Lund with all our luggage! Lund Cathedral, which will celebrate its 900th anniversary in 2023. A historic Swedish home, as reconstructed in Kulturen, Lund. A historic structure, as reconstructed in Kulturen, Lund, Sweden. The 1652 Swedish chapel in Kulturen, Lund, Sweden. Interior of the 1652 Swedish chapel, Kulturen, Lund, Sweden. Interior and organ of the 1652 Swedish chapel, Kulturen, Lund, Sweden. Corey De Tar plays the historic organ in the 1652 chapel, Kulturen, Lund, Sweden. 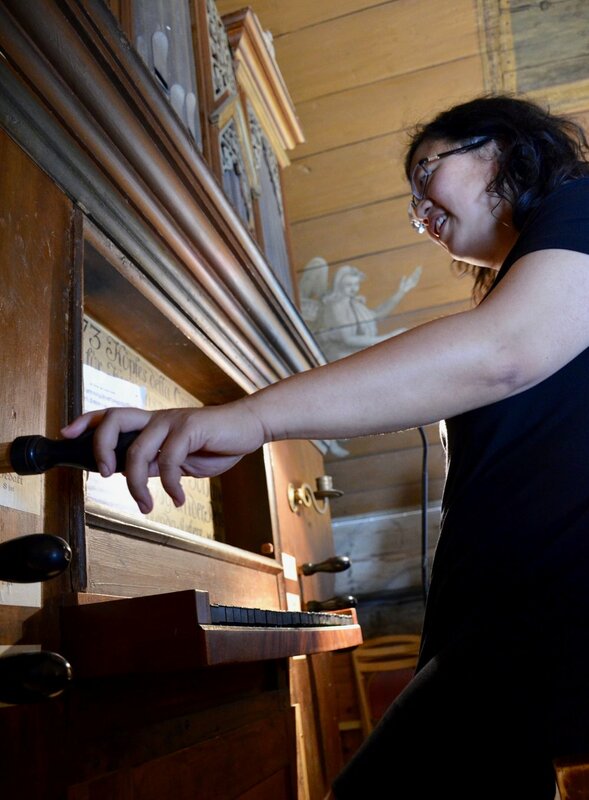 Jennifer Hsiao plays the historic organ in the 1652 chapel, Kulturen, Lund, Sweden. Christian Lane in the 1652 chapel, Kulturen, Lund, Sweden. The historic organ in the 1652 chapel, Kulturen, Lund, Sweden. Brandon Santini plays the historic organ in the 1652 chapel, Kulturen, Lund, Sweden. Adrian Cho plays the historic organ in the 1652 chapel, Kulturen, Lund, Sweden. Chris Porter plays the historic organ in the 1652 chapel, Kulturen, Lund, Sweden. Brandon Santini in the 1652 chapel, Kulturen, Lund, Sweden. The 1934 Marcussen organ in Lund Cathedral. 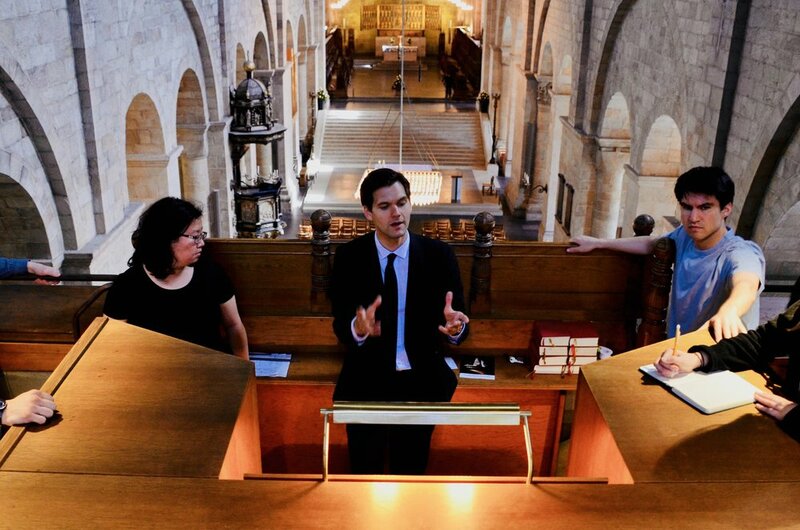 Cathedral organist Robert Bennesh introduces the 1934 Marcussen organ in Lund Cathedral. Robert Bennesh introduces the 1934 Marcussen organ in Lund Cathedral. 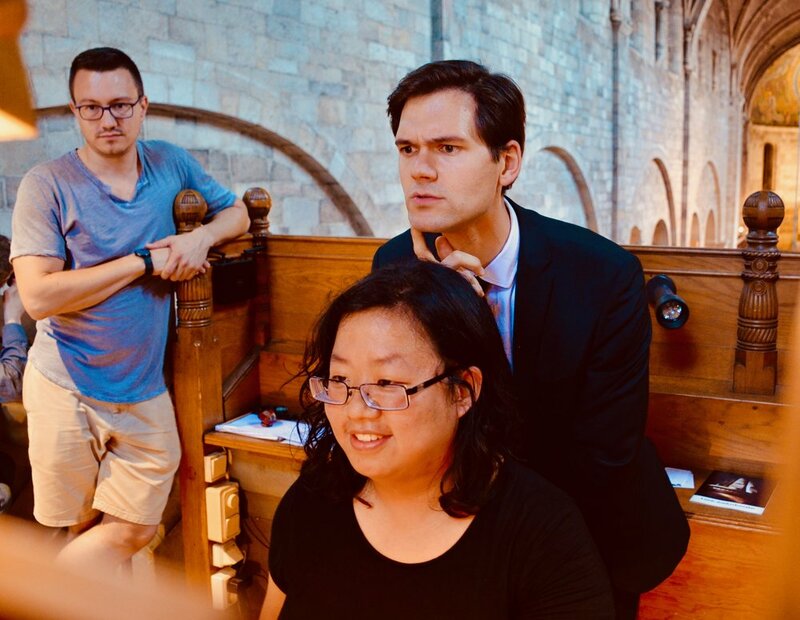 Robert Bennesh assists Jennifer Hsiao with registrations on the 1934 Marcussen organ in Lund Cathedral. Lund Cathedral, as seen from the organ gallery. Corey De Tar plays the 1934 Marcussen organ in Lund Cathedral. The 1424 astronomical clock in Lund Cathedral. “Finn” is turned to stone, affixed to a column in Lund Cathedral. Robert Bennesh offers a tour of Lund Cathedral, with the choir organ behind. The 1907 Åckerman & Lund organ in S:t Johannes kyrka, Malmö, Sweden. Jennifer Hsiao plays the 1907 Åckerman & Lund organ in S:t Johannes kyrka, Malmö, Sweden. Laura Gullet plays the 1907 Åckerman & Lund organ in S:t Johannes kyrka, Malmö, Sweden. S:t Johannes kyrka, Malmö, Sweden. Corey De Tar plays the 1907 Åckerman & Lund organ in S:t Johannes kyrka, Malmö, Sweden. Brandon Santini plays the 1907 Åckerman & Lund organ in S:t Johannes kyrka, Malmö, Sweden. Console detail, 1907 Åckerman & Lund organ in S:t Johannes kyrka, Malmö, Sweden. Christian Lane plays the 1907 Åckerman & Lund organ in S:t Johannes kyrka, Malmö, Sweden. Resident organist Mats Hultkvist, Robert Bennesh, and Christian Lane in St. John’s Church, Malmö. Chris Porter, Brandon Santini, and Laura Gullett enjoy dinner at Warpigs, Copenhagen.